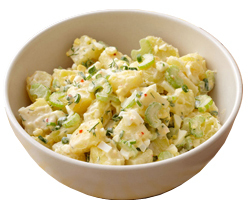 There has been a potato salad attack reported in Florida. Days after a Sunshine State resident was nabbed for attacking his girlfriend with a plate of sauerkraut, a Bradenton man is facing a domestic battery charge for allegedly pelting his mother with potato salad during a confrontation in their home. Jonathan Smith, 34, was arrested Saturday evening after his mother Jennifer told cops that he attacked her as she sat down to eat dinner (potato salad and chicken) in the living room. “Jonathan grabbed a hand full of potato salad and threw it,” striking his mother in the face, reported cops, who noted that the woman had “food all over her and in her hair” when they arrived at the residence. Though his mother yelled for him to stop, Smith “continued to throw food at his mother,” according to a probable cause affidavit. In addition to the misdemeanor battery count, Smith--who is being held in the county jail--is also facing a probation violation charge stemming from a prior felony conviction. He is scheduled for a September 24 court appearance.